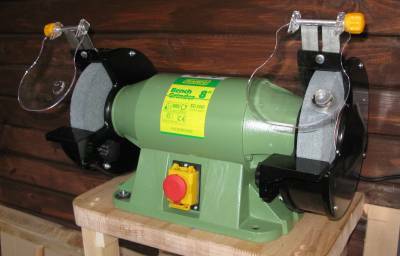 If you have a workshop then there are 2 power tools that will form the basis: a bandsaw and a bench grinder. This really is a heavy duty solid bench grinder that is more than capable of anything a model engineer can throw at it. The grinder starts very smoothly and runs at 2950rpm (in the picture you can see that I only have two bolt fixing s in place – I will sort this over the next couple of days, but does prove how confident I’m with the machine). The one thing to check for when buying a grinder is that it has solid tool rests, the last thing you need is for these to flex when you are trying to accurately grind the angle on a drill or lathe tool. 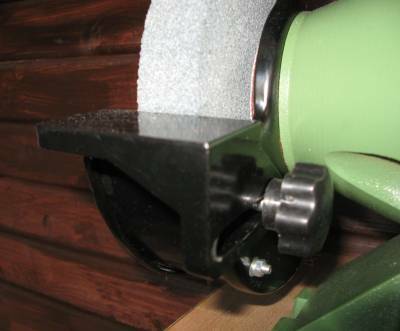 In this area the Warco bench grinder excels itself as these are cast tool rests that are fixed with a large bolt. This is a 950W motor with direct drive to the wheels making it reasonably quiet in operation and importantly very powerful. This grinder takes a lot to make it slow down when in use. I have used the grinder for years and on everything from 12mm square HSS lathe tools where it is quite capable of removing large amounts of material quite rapidly. I also use this to put an edge on gardening tools when required. The casings around the wheels are pressed steel with dust extraction at the rear. Overall a solid and powerful bench grinder. You will buy this tool and it will last you a lifetime. Visit warco.co.uk for more information. Still using this grinder 7 years later and working superbly, fairly light hobby use and still has original wheels fitted.